LODGE OF ENTERED APPRENTICES, FELLOW CRAFTS, OR MASTER MASONS. 1. Candidate prays. 2. First stop. 3. Second stop. 4. Third stop. 5. Room where candidates are prepared. 6. Ante-room where members enter the lodge. 7. Hall. 8. Doors. 9. Door through which candidates are admitted into the lodge. 10. Door through which members enter. 11. Altar. 12. Treasurer. 13. Secretary. 14. Senior Deacon. 15. Worshipful Master. 16. Junior Warden. 17 and 18. Stewards. 19. Senior Warden. 20. Junior Deacon. 21. Tyler. of the different degrees (E. A., F. C., and M. M.); but they are masonically styled by the Craft as the Ground Floor, Middle Chamber, and Sanctum Sanctorum. a Third Degree sign, they would see it; consequently, caution on this point should always be given to such brethren by the Tyler, before entering the Lodge. J. D.--Worshipful Master, there is an alarm at the inner door of our Lodge. W. M.--Attend to the alarm, Brother Junior, and ascertain the cause. names (which we will suppose to be Jones, Brown, and Smith). J. D. (to the Master)--Brothers Jones, Brown, and Smith are without, and wish admission. If they are known to the Master, he will say, "Admit them." Deacon opens the door, and says, in an under tone of voice, "Come in." These brothers advance to the centre of the Lodge, at the altar make the duegard, and sign of the degree on which the Lodge is opened, which is responded to by the Master, and then take their seats among the brethren. No brother is allowed to take his seat until he has saluted the Worshipful Master on entering a Lodge; and if one omits his duty in this respect, he is immediately reminded of it by either the Master or some one of the brethren present. The Tyler generally cautions the brethren, before entering the Lodge, about giving the sign, before passing them through the door; the Junior Deacon the same, as soon as they are in. This officer's station is at the inner door, and it is his duty to attend to all alarms from the outside, to report the same to the Master, and get his permission before admitting any one. The author remembers seeing the duegard and sign of a Master Mason given, while yet an Entered Apprentice Mason: he was sitting one evening in the Lodge, when a brother of the Third Degree came in, and very carelessly saluted the Master with the Master's duegard and sign, undoubtedly supposing the Lodge open on that degree--a very common error among Masons. us, they will vouch for our masonic standing. The Tyler does so, in the manner already described; and, if they are vouched for by either Master or any brother, they are admitted, the Tyler telling them on what degree the Lodge is opened, besides furnishing them with aprons. On the evening of a Lodge-meeting, brethren generally get together at an early hour at the Lodge-room, which has been opened and cleaned out by the Tyler. On arrival of the Master, and the hour of meeting, the Master repairs to his seat in the east, puts on his hat, 1 sash, yoke, and apron, with gavel in hand, and says: "Brethren will he properly clothed and in order; officers repair to their stations for the purpose of opening." At this announcement the brethren put on their aprons, and seat themselves around the Lodge-room, while the officers invest themselves with their yokes and aprons, and take their stations as represented in Plate on page 8, viz. : Senior Warden in the west; Junior Warden in the south; Senior Deacon in front of the Worshipful Master in the east, and a little to his right hand, with a long rod in hand; Junior Deacon at the right hand of the Senior Warden in the west, guarding the inner door of the Lodge, with rod in hand; Secretary at the left of the Worshipful Master, and Treasurer at the right; and, generally, two Stewards on the right and left of the Junior Warden in the south, with rods in hand. After all are thus seated, the Worshipful Master says: "Is the Tyler present? If so, let him approach the east." At this command, the Tyler, who is all this time near the outer door of the Lodge, approaches the Worshipful Master's seat in the east, with yoke and apron on. W. M.--Brother Tyler, your place in the Lodge? Tyler--To keep off all cowans and eavesdroppers, and not to pass or repass any but such as are duly qualified and have the Worshipful Master's permission. The Tyler retires to the inside of the outer door of the ante-room, and all Lodge-doors are closed after him. [paragraph continues] Junior Deacon, the first and constant care of Masons when convened? Junior Deacon--To see that the Lodge is duly tyled. W. M.--You will attend to that part of your duty, and inform the Tyler that we are about to open a Lodge of Entered Apprentice Masons (Fellow Crafts, or Master Masons, as the case may be), and direct him to tyle accordingly. J. D. (makes the sign of an Entered Apprentice Mason, see Fig. 2, page 17.) --To carry orders from the Senior Warden in the west to the Junior Warden in the south, and elsewhere around the Lodge, as he may direct, and see that the Lodge is tyled. refreshment, superintend them during the hours thereof, and see that the means of refreshment be not converted into intemperance or excess; and call them on to labor again, that they may have pleasure and profit thereby. J. W. (to the Lodge.) --Brethren, you have heard the orders of the Worshipful Master, as communicated to me through the Senior Warden in the west. You will please take notice, and govern yourselves accordingly. FIG. 1. DUEGARD OF AN ENTERED APPRENTICE. After which the Master makes the sign of an Entered Apprentice Mason, which alludes to the penalty of the Entered Apprentice's obligation, which is imitated by all the brethren present. The Master then makes the duegard of a Fellow Craft, which alludes to the position of the hands when taking the oath of a Fellow Craft Mason. After which he gives the sign of a Fellow Craft. which alludes to the penalty of the Fellow Craft obligation. Next is the duegard of a Master Mason, which alludes to the position of the hands when taking the oath of a Master Mason, both hands resting on the Holy Bible, square, and compasses. FIG. 2. SIGN OF AN ENTERED APPRENTICE. FIG. 3. DUEGARD OF A FELLOW CRAFT MASON. FIG 4. SIGN OF A FELLOW CRAFT MASON. FIG 5. DUEGARD OF A MASTER MASON. FIG. 6. SIGN OF A MASTER MASON. FIG. 7. GRAND HAILING SIGN OF DISTRESS. And then (Fig. 6) the sign of a Master Mason, which alludes to the penalty of the obligation of a Master Mason. The last sign given (Fig. 7) is the "grand hailing sign of distress." "Behold, how good and how pleasant it is for brethren to dwell together in unity! It is like the precious ointment upon the head, that ran down upon the beard, even Aaron's beard; that went down to the skirts of his garments; as the dew of Hermon, and as the dew that descended upon the mountains of Zion: for there the Lord commanded the blessing, even life forever more." Amen! Responded to by all the brethren present: "Amen! So mote it be!" W. M. (gives one sound of the gavel.) --All are seated and ready for business. [paragraph continues] First Degree. The following manner is generally adopted among Masons at the present day, though there are two or three ways. S. W.--I am not sure that all present are Master Masons, but will ascertain through my proper officers, and report. S. W.--Deacons will approach the west (Deacons, both Junior and Senior, repair to the Warden's station in the west); first the Senior Deacon whispers the password of a Master Mason in the ear of the Junior Deacon (Tubal Cain), and the Senior Deacon whispers the same in the Senior Warden's ear, when one Deacon passes up one side of the Lodge, and the other the other side, and, as they go, stop at each brother present for the pass-word, which each brother rises up and whispers in the ear of the Deacon (Tubal Cain); if there are any present that cannot give it, the Deacons pass them by, especially if they are lower degree members (Entered Apprentices or Fellow Crafts), and after the Deacons have gone through the entire Lodge, they meet before the Worshipful Master in the east; the Senior Deacon gets the pass again from the Junior Deacon, and passes it up to the Master, and then they return to the Senior Warden in the west, and pass the same up to him in the same way, and take their seats again, as in . The Warden then rises and says--All present are not Master Masons, Worshipful. W. M.--All below the degree of Master Mason will please retire while we raise the Lodge. The Junior Deacon says to those below Master Mason, "Brothers, please retire," and he sees that they do so. After they are out, and the door is closed by the Junior Deacon, the Senior Warden says: "All present are Master Masons, Worshipful, and makes the sign of a Master Mason." W. M.--If you are satisfied that all present are Master Masons, you will have them come to order as such, reserving yourself for the last. S. W. (gives three raps with his gavel, when all in the Lodge rise to their feet.) --Brethren, you will come to order as Master Masons. the Master again one rap, followed up by the Wardens, until they have rapped three times each. W. M.--Brother Secretary, you will please read the minutes of our last regular communication. MASONIC HALL, New YORK, December 8, A. L. 5860. A regular communication of St. John's Lodge, No. 222, of Free and Accepted Masons, was holden at New York, Wednesday, the 10th of November, A. L. 5860. Brother James B. Young, of Union Lodge, No. 16, Broadway, New York. Brother George J. Jones, Rochester Lodge, No. 28, Rochester, New York. Brother Benjamin Scribble, of Hiram Lodge, No. 37, New Orleans, Louisiana. Brother Stephen Swift, of Cleveland Lodge, No. 99, Cleveland, Ohio. Brother Robert Morris, of Lexington Lodge, No. 7, Lexington, Kentucky. Lodge was opened in due form on the Third Degree of Masonry. The minutes of the last communication of St. John's Lodge were read and confirmed. The committee on the petition of John B. Crockerberry, a candidate for initiation, reported favorably, whereupon he was balloted for, and duly elected. The committee on the application of D. C. Woolevert, a candidate for initiation, reported favorably; whereupon he was balloted for, and the box appearing foul, he was declared rejected. The committee on the application of William S. Anderson, a candidate for initiation, having reported unfavorably, he was declared rejected, without a ballot. A petition for initiation from Robert Chase, of Jersey City, accompanied by the usual fee of ten dollars ($10), and recommended by Brothers Hart, Lewis, and Onion, was referred to a committee of investigation, consisting of Brothers Slick, Wise, and Swift. Brother Samuel Brevoort, an Entered Apprentice, having applied for advancement, was duly elected to the Second Degree; and Brother Thomas Jansen, a Fellow Craft, was, on his application for advancement, duly elected to the Third Degree in Masonry. Lodge of Master Masons was then closed, and a Lodge of Entered Apprentices opened in due form. 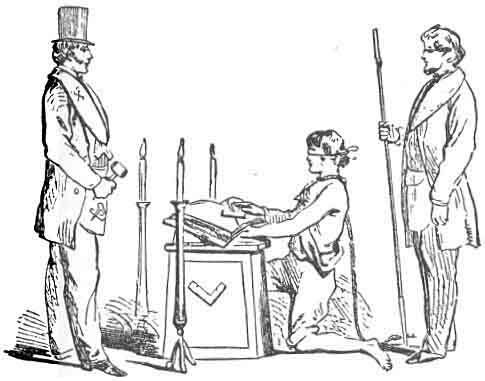 Mr. Charles Fronde, a candidate for initiation, being in waiting, was duly prepared, brought forward, and initiated as an Entered Apprentice Mason in due and ancient form, he paying the further sum of five dollars ($5). Lodge of Entered Apprentices closed, and a Lodge of Fellow Crafts opened in due form. Brother Stephen Currie, an Entered Apprentice, being in waiting, was duly prepared, brought forward, and passed to the degree of a Fellow Craft, he paying the further sum of five dollars ($5). Lodge of Fellow Crafts closed, and a Lodge of Master Masons opened in due form. Brother John Smith, a Fellow Craft, being in waiting, was duly prepared, brought forward, and raised to the sublime degree of a Master Mason, he paying the further sum of five dollars ($5). Such is the form which has been adopted as the most convenient mode of recording the transactions of a Lodge at the present day. The minutes of a Lodge should be read at the close of each meeting, that the brethren may suggest any necessary alterations or additions, and then at the beginning of the next regular meeting, that they may be confirmed. W. M.--Brother Senior Warden, have you any alterations to propose? S. W. (makes the sign of a Master Mason, see Fig. 6, page 18.) --I have none, Worshipful. W. M.--Have you any, Brother Junior Warden? J. W. (sign, Fig. 6.) --None, Worshipful. W. M.--Has any brother around the Lodge any alterations to propose? (None offering) W. M.--Then, brethren, the motion is on the confirmation of the minutes of our last communication; all that are in favor of their confirmation will make it known by the usual sign of a Mason (see Fig 6, page 18--raise the right hand); those opposed, by the same sign, which is called the usual sign of a Mason. The question of confirmation is simply a question whether the secretary has faithfully and correctly recorded the transactions of the Lodge. If it can be satisfactorily shown by any brother that there are any omissions or misentries, this is the time to correct them. desirous of being admitted a member thereof, if found worthy. His place of residence is New York City, his age thirty-eight years, his occupation a bookseller. (Signed) ABNER CRUFF. Recommended by Brothers Jones, Carson, and Fox. NEW YORK, December 1, 1860. Sec.--The next petition is from Peter Locke, recommended by Brothers Derby and Jackson. Both these petitions are accompanied by the usual fee of ten dollars each. W. NI.--Brethren, what is your pleasure respecting these petitions of Gruff and Locke? Brother Hand--I would move that they be received, and a committee of investigation be appointed. Brother Fast--I second that motion, Worshipful. W. M.--Brethren, you have heard the motion. All those in favor of the motion, make it known by the usual sign; all to the contrary, the same. W. M.--The petitions are received, and I would appoint, on the application of Mr. Cruff, Brothers Brevoort, Gore, and Acker-man; and, on the petition of Mr. Locke, Brothers Derby, Hart, and Barnes. W. M. (receiving reports of committees.) --Brother Secretary, are there any committee reports due on your desk? Sec.--There are two reports, Worshipful. One on the application of Mr. Robert Granger, and one on the application of Mr. Brady. W. AL--Are the chairmen of those committees present? W. M.--Is the chairman of the committee to whom was referred the application of Peter Locke present? and report favorably. He is recommended as one of the best of men. W. M.--Brethren, what's your pleasure with the petition of Mr. Locke? Brother Jones--I move, Worshipful, that the report be received, committee discharged, and the candidate balloted for. Brother Jackson--I second that motion. W. M.--Brethren, you have heard the motion. All in favor of it, make it known by the usual sign; the contrary, the same. W. M. (balloting for candidates, or admission.) --Brother Secretary, are there any candidates to be balloted for? Sec.--There are, Worshipful, two, viz. : Joseph Locker and Reuben Bruce. W. M.--If there is nothing to offer, we will proceed to ballot. Brother Senior Deacon, you will prepare the ballot-box. Senior Deacon takes the ballot-box (which is a small box, five or six inches square, with two drawers in it, and a small hopper in the top, a hole from which passes down into the first drawer, which is empty and shoved in, while the lower one is drawn out and nearly full of both black and white balls), places the box on the altar in the middle of the Lodge, and takes his seat again. W. M.--Brethren, you will proceed to ballot. The balloting is done as follows, viz. : Master first; Secretary calls the names, commencing with the Senior Warden down to the Tyler, and, as their names are called, each Mason steps up to the box at the altar, makes the sign of Master Mason to the Master, and then takes from the lower drawer of the ballot-box a ball (white or black, as he sees fit), deposits it in the hopper above, and retires to his seat. So all vote. W M.--Have all voted? If so, Brother Senior Deacon, you wild close the ballot. W. M.--Brother Junior Warden, how stands the ballot in the south? W. M.--Brother Senior Warden, how stands the ballot in the west? W. M.--And clear (or not clear) in the east. Brethren, you have elected (or not) Mr. Joseph Locker to the First Degree in Masonry. The other candidate is balloted for in the same manner. W. M. (conferring Degrees.) --Brother Junior Deacon, you will ascertain whether there are any candidates in waiting, and for what Degree, and report at once. The Junior Deacon inquires of the Tyler and brethren generally, and reports some one will name a candidate who has been previously balloted for, who will probably be waiting in the ante-room. J. D.--There is one, or two (as the ease may be) now in waiting for the First Degree, Mr. Peter Gabe and Mr. John Milke. W. M.--Brethren, there seems to be a good deal of business on hand this evening; but my business engagements are such as to render it impossible for me to be present very late, consequently we will confer the Degree upon Mr. Gabe only, and will call a special communication next week to attend to Mr. Milke's wants. You will inform Mr. Milke, Brother Junior Deacon, of our decision, and not keep him any longer in waiting. You will also say to Mr. Gabe, that as soon as we finish the regular business of the Lodge, he can have the First Degree conferred on him. Junior Deacon does his duty. W. M. (considering unfinished business.) --No unfinished business. W. M. (disposing of such other business as may lawfully come before the Lodge.) --Brethren, if there is no further business before this Lodge of Master Masons, we will proceed to close the same, and open an Entered Apprentices' Lodge, for the purpose of initiation. Here Lodges differ, in the mode of lowering from a Masters' to an Entered Apprentices' Lodge. Some close entirely, and open on the First; but we will adopt a short way, that Lodges have at the present day. W. M.--Brother Senior Warden, are you sure all present are Entered Apprentice Masons? S. W.--I am sure, Worshipful, all present are Entered Apprentice Masons. W. M.--If you are sure all present are Entered Apprentice Masons, you will have them come to order as such, reserving yourself for the last. S. W. (gives three raps with his gavel, all rise to their feet.) --Brethren, you will come to order as Entered Apprentice Masons. The members place their hands in the position of a duegard of an Entered Apprentice. (See Plate 1, page 16.) When the Master makes "the sign, by drawing his hand across his throat, all follow suit; Worshipful then makes one rap with the gavel, Senior Warden one, and the Junior Warden one. W. M.--I now declare this Lodge of Master Masons closed, and an Entered Apprentice in its stead. Brother Junior Deacon, inform the Tyler; Brother Senior Deacon, attend at the altar (which is placing both points of the compasses under the square). (Worshipful Master gives one rap, which seats the whole Lodge.) Brother Junior Deacon, you will take with you the necessary assistants (the two Stewards), repair to the ante-room, where there is a candidate in waiting (Mr. Gabe, for the First Degree in Masonry), and, when duly prepared, you will make it known by the usual sign (one rap). Do you seriously declare, upon your honor, that, unbiassed by friends, and uninfluenced by mercenary motives, you freely and voluntarily offer yourself a candidate for the mysteries of Masonry? Do you seriously declare, upon your honor, that you are prompted to solicit the privileges of Masonry by a favorable opinion of the institution, a desire for knowledge, and a sincere wish of being serviceable to your fellow-creatures? Do you seriously declare, upon your honor, that you will con-form to all the ancient established usages of the Order? The Secretary returns to the Lodge, and reports that the candidate has given his assent to the interrogations. The candidate is now requested to strip. The figure is a representation of the candidate duly and truly prepared for the First Degree in Masonry. J. D. (who always responds for the candidate.)--Mr. Peter Gabe, who has long been in darkness, and now seeks to be brought to light, and to receive a part in the rights and benefits of this worshipful Lodge, erected to God, and dedicated to the holy Sts. John, as all brothers and fellows have clone before. S. D.--Mr. Gabe, is it of your own free-will and accord? S. D.--Brother Junior Deacon, is he worthy, and well qualified? S. D.--Duly and truly prepared? S. D.--Of lawful age, and properly vouched for? S. D.--By what further right or benefit does he expect to gain admission? J. D.--By being a man, free born, of good repute, and well recommended. S. D.--Since he is in possession of all these necessary qualifications, you will wait with patience until the Worshipful Master is informed of his request, and his answer returned. W. M.--Let him enter, and be received in due form. S. D.--Let him enter, and be received in due form. S. D.--Mr. Gabe, on entering this Lodge for the first time, I receive you on the point of a sharp instrument pressing your naked left breast, which is to teach you, as it is a torture to your flesh, so should the recollection of it ever be to your mind and conscience, should you attempt to reveal the secrets of Masonry unlawfully. W. M.--Let no one enter on so important a duty without first invoking the blessing of the Deity. Brother Senior Deacon, you will conduct the candidate to the centre of the Lodge, and cause him to kneel for the benefit of prayer. W. M.--Vouchsafe Thine aid, Almighty Father of the Universe, to this our present convention; and grant that this candidate for Masonry may dedicate and devote his life to Thy service, and become a true and faithful brother among us! Endue him with a competency of Thy divine wisdom, that, by the secrets of our art, he may be better enabled to display the beauties of brotherly love, relief, and truth, to the honor of Thy Holy Name. Amen. Responded to by all, "So mote it be." W. M. (rising to his feet, taking candidate by the right hand, placing his left on his head.)--Mr. "Gabe" (sometimes Masters say, "Stranger! "), in whom do you put your trust? W. M.--Since in God you put your trust, your faith is well founded. Arise (assists candidate to rise), follow your conductor and fear no danger. officer's station, east, south, and west, they give one sound with their gavels, viz. : first the Master, one (•): J. W., one (•); S. W., one (•); which has a good effect on the candidate, the sounds being near his ears as he passes by (his conductor generally passing close up). Having passed once around the Lodge, they halt at the Junior Warden's station in the south. J. W. (gives one rap; conductor one.) --Who comes here? Conductor (S. D.)--Mr. Peter Gabe. who has long been in darkness, and now seeks to be brought to light, and to receive a part in the rights and benefits of this Worshipful Lodge, erected to God, and dedicated to the holy St. John, as all brothers and fellows have done before. J. W.--Mr. Gabe, is it of your own free will and accord? J. W.--Brother Senior Deacon, is he worthy and well qualified? S. D.--He is. J. Ws--Duly and truly prepared? S. D.--Re is. J. W.--Of lawful age, and properly vouched for? J. W.--By what further right or benefit does he expect to gain admission? S. D.--By being a man, free born, of good repute, and well recommended. J. W.--Since he is in possession of all these necessary qualifications, I will suffer him to pass on to the Senior Warden's station in the west. W. M.--From whence come you, and whither are you travelling? S. D.--From the west, and travelling toward the east. W. M.--Why leave you the west and travel toward the east? S. D.--In search of light. W. M.--Since light is the object of your search, you will reconduct the candidate, and place him in charge of the Senior Warden in the west, with my orders that he teach this candidate to approach the east, the place of light, by advancing with one upright, regular step to the first stop, the heel of his right placed in the hollow of his left foot, his body erect at the altar (see Fig. 14), before the Worshipful Master in the east. S. D.--Brother Senior Warden, it is the orders of the Worshipful Master, that you teach this candidate to approach the east, the place of light, by advancing on one regular upright step to the first stop; the heel of his right foot in the hollow of his left (see Fig. 14, p. 93), his body erect at the altar before the Worshipful Master in the east. Senior Warden leaves his seat, comes down to the candidate, faces him towards the Worshipful Master, and requests him to step off with his left foot, bringing the heel of his right in the hollow of his left (see step 1, Fig. 14, page 93--before the candidate is requested to do this, he is led by the Warden within one pace of the altar). Senior Warden reports to the Worshipful Master. S. W.--The candidate is in order, and awaits your further will and pleasure. W. M.--Mr. Gabe, before you can be permitted to advance any farther in Masonry, it becomes my duty to inform you, that you must take upon yourself a solemn oath or obligation, appertaining to this degree, which I, as Master of this Lodge, assure you will not materially interfere with the duty that you owe to your God, yourself, family, country, or neighbor. Are you willing to take such an oath? W. M.--Brother Senior Warden, you will place the candidate in due form, which is by kneeling on his naked left knee, his right forming the angle of a square, his left hand supporting the Holy Bible, square, and compasses, his right hand resting thereon. 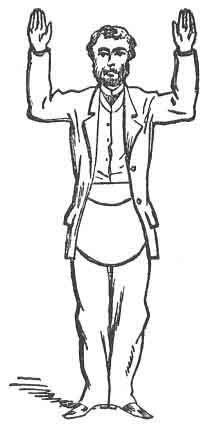 The Warden now places, or causes the candidate to be placed, in the position commanded by the Worshipful Master, as shown in Figure 8. FIG. 8. CANDIDATE TAKING THE OATH OF AN ENTERED APPRENTICE. yourself the solemn oath of an Entered Apprentice Mason, and, if you have no objections still, you will say I, and repeat your name after me. Master gives one rap with his gavel which is the signal for all present to assemble around the altar. I, Peter Gabe, of my own free will and accord, in the presence of Almighty God, and this Worshipful Lodge, erected to Him, and dedicated to the holy Sts. John, 1 do hereby and hereon (Master presses his gavel on candidate's knuckles) most solemnly and sincerely promise and swear, that I will always hail, 2 ever conceal, and never reveal, any of the arts, parts, or points of the hidden mysteries of Ancient Free Masonry, which may have been, or hereafter shall be, at this time, or any future period, communicated to me, as such, to any person or persons whomsoever, except it be to a true and lawful brother Mason, or in a regularly constituted Lodge of Masons; nor unto him or them until, by strict trial, due examination, or lawful information, I shall have found him, or them, as lawfully entitled to the same as I am myself. I furthermore promise and swear that I will not print, paint, stamp, stain, cut, carve, mark, or engrave them, or cause the same to be done, on any thing movable or immovable, capable of receiving the least impression of a word, syllable, letter, or character, whereby the same may become legible or intelligible to any person under the canopy of heaven, and the secrets of Masonry thereby unlawfully obtained through my unworthiness. myself under no less penalty than that of having my throat cut across, 1 my tongue torn out by its roots, and my body buried in the rough sands of the sea, at low-water mark, 2 where the tide ebbs and flows twice in twenty-four hours, should I ever knowingly violate this my Entered Apprentice obligation. So help me God, and keep me steadfast in the due performance of the same. 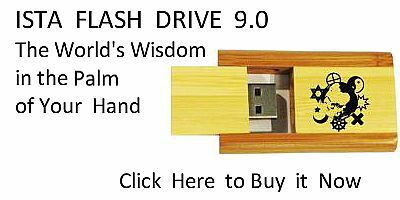 W. M.--In token of your sincerity, you will now detach your hands, and kiss the book on which your hands rest, which is the Holy Bible. W. M.--Brethren, you will stretch forth your hands, and assist me in bringing our newly made brother to light. Here the brethren surrounding the altar place their hands in form of duegard of an Entered Apprenticed Mason (see Fig. 1, p. 16). strips off the hoodwink from the candidate's eyes, but keeps him yet kneeling at the altar. Some Masters say--As we now hold the brother by a stronger tie. W. M.--My brother, on being brought to light in this degree, you discover both points of the compasses hid by the square, which is to signify that you are yet in darkness as respects Masonry, you having only received the degree of an Entered Apprentice. You also discover the three great lights of Masonry, by the help of the three lesser. 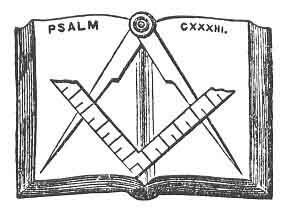 The three great lights in Masonry are the Holy Bible, square, and compasses, which are thus explained: the Holy Bible is the rule and guide of our faith and practice; the square, to square our actions; the compasses, to circumscribe and keep us within bounds with all mankind, but more especially with a brother Mason. The three lesser lights are the three burning tapers which you see placed in a triangular form about this altar. They represent the sun, moon, and Master of the Lodge; and as the sun rules the day, and the moon governs the night, so ought the Worshipful Master to endeavor to rule and govern his Lodge, with equal regularity. FIG. 9 THE GRIP OF AN ENTERED APPRENTICE. W. M. (looking the Deacon in the eye, while holding candidate by the right hand.) --I hail. W. M.--What do you conceal? [paragraph continues] (here presses his thumb-nail on the joint) token alludes. S. D.--Of an Entered Apprentice Mason. W. M.--Has it a name? W. M.--Will you give it me? S. D.--I did not so receive it; neither can I so impart it. W. M.--How will you dispose of it? S. D.--I will letter it, or halve it. W. M.--Letter it, and begin. W. M. (helping candidate to rise from the altar, by the right hand.) --Rise, my brother, and salute the Junior and Senior Wardens as an obligated Entered Apprentice. Here Lodges differ; some only pass candidate once around the room, and, as he passes the officers' stations, he gives the duegard and sign of an Entered Apprentice; while other Lodges require him to halt at the Wardens' stations, and pass through with the following ceremony, viz. : The Deacon takes candidate by the right arm, and passes around the altar to the Junior Warden's station in the south, stops, gives one rap with his rod on the floor, which is responded to by the Junior Warden with his gavel, once. S. D.--An obligated Entered Apprentice. J. W.--How shall I know him to be such? S. D.--By signs and tokens. S. D.--Right angles, horizontals, and perpendiculars ( , , ). J. W.--Give me a sign. J. W.--Has it an allusion? S. D.--It has; it alludes to the manner in which my hands were placed when I took upon myself the obligation of an Entered Apprentice Mason. J. W.--Have you any further sign? S. D.--Sign of an Entered Apprentice Mason. S. D.--I have not; but I have a token. Senior Deacon makes candidate take the Junior Warden by the right hand. J. W.--What do you conceal? S. D.--All the secrets of Masons, in Masons, to which this (here presses his thumb-nail on the joint) token alludes. S. D.- Of an Entered Apprentice Mason. J. W.--Has it a name? J. W.--Will you give it me? S. D.--I did not so receive it, neither will I so impart it. J. W.--How will you dispose of it? J. W.--Letter it, and begin. J. W.--I am satisfied, and will suffer you to pass on to the Senior Warden in the west for his examination. apron, which is an emblem of innocence and the badge of a Mason, more ancient than the Golden Fleece or Roman Eagle, and, when worthily worn, more honorable than the Star and Garter, or any other order that can be conferred on you at this time, or any future period, by kings, princes, and potentates, or any other persons, except it be by Masons. I trust that you will wear it with equal pleasure to yourself and honor to the fraternity. You will carry it to the Senior Warden in the west, who will teach you how to wear it as an Entered Apprentice. S. D.--Brother Senior Warden, it is the order of the Worshipful Master, that you teach this new-made brother how to wear his apron as an Entered Apprentice. The Senior Warden takes the apron and ties it on the candidate, with the flap turned up, remarking to the candidate as he does so: This is the way, Brother Gabe, that Entered Apprentices wore their aprons at the building of King Solomon's Temple, and so you will wear yours until further advanced. Senior Deacon now reconducts the candidate to the Worshipful Master in the east. W. M.--Brother Gabe, agreeably to an ancient custom, adopted among Masons, it is necessary that you should be requested to deposit something of a metallic kind or nature, not for its intrinsic valuation, but that it may be laid up among the relics in the archives of this Lodge, as a memento that you were herein made a Mason. Anything, brother that you may have about you, of a metallic nature, will be thankfully received--a button, pin, five or ten cent piece--anything, my brother. W. M.--Brother Senior Deacon, you will now reconduct this candidate to the place from whence he came, and reinvest him with that which he has been divested of, and return him to the Lodge for further instruction. Senior Deacon takes candidate by the arm, leads him to the centre of the Lodge, at the altar before the Worshipful Master in the east, makes duegard and sign of an Entered Apprentice, and then retires to the ante-room. After candidate is clothed, the deacon ties on his apron, and, returning to the Lodge, conducts him to the Worshipful Master in the east, who orders the Deacon to place him in the northeast corner of the Lodge, which is at the Master's right. [paragraph continues] Entered Apprentice, it is necessary you should have the working-tools of an Entered Apprentice, which are the twenty-four-inch gauge and common gavel. into three parts, whereby we find a portion for the service of God and the relief of a distressed worthy brother, a portion for our usual avocations, and a portion for refreshment and sleep. for the builder's use; but we, as Free and Accepted Masons, are taught to make use of it for the more noble and glorious purpose of divesting our minds and consciences of all the vices and superfluities of life, thereby fitting us, as living stones, for that spiritual building, that house not made with hands, eternal in the heavens. A. From a Lodge of the Sts. John of Jerusalem. Q. What came you here to do? A. To learn to subdue my passions and improve myself in Masonry. Q. Then I presume you are a Mason? Q. How do you know yourself to be a Mason? A. By having been often tried, never denied, and willing to be tried again. Q. How shall I know you to be a Mason? A. By certain signs, a token, a word, and the perfect points of my entrance. A. Right angles, horizontals, and perpendiculars ( , , ). A. Certain friendly or brotherly grips, by which one Mason may know another in the dark as well as in the light. Q. Give me a sign. Q. Has that an allusion? A. It has; to the penalty of my obligation. Q. Give me a token. Q. What do you conceal? A. All the secrets of Masons, in Masons, to which this (here press with thumb-nail the first joint hard) token alludes. A. Of an Entered Apprentice Mason. Q. Has it a name? Q. Will you give it me? A. I did not so receive it, neither will I so impart it. Q. How will you dispose of it? A. I will letter it or halve it. Q. Letter it, and begin. Q. Where were you first prepared to be made a Mason? Q. Where were you next prepared? Q. How were you prepared? Q. How did you know it to be a door, being hoodwinked? A. By first meeting with resistance, afterward gaining admission. Q. How gained you admission? A. By three distinct knocks. Q. What were said to you from within? A. Mr ------, who has long been in darkness, and now seeks to be brought to light, and to receive a part in the rights and benefits of this worshipful Lodge, erected to God, and dedicated to the holy Ste. John, as all brothers and fellows have done before. A. If it was of my own free will and accord; if I was worthy and well qualified; duly and truly prepared; of lawful age and properly vouched for. All of which being answered in the affirmative, I was asked by what further right or benefit I expected to gain admission. A. By being a man, free born, of good repute, and well recommended. A. I was directed to wait with patience until the Worshipful Master should be informed of my request, and his answer returned. A. Let him enter, and be received in due form. Q. How were you received? A. On the point of a sharp instrument pressing my naked left breast. A. I was conducted to the centre of the Lodge, caused to kneel, and attend at prayer. Q. After attending at prayer, what were you then asked? A. In whom I put my trust. A. My trust being in God, I was taken by the right hand, and informed that my faith was well founded; ordered to arise, follow my conductor, and fear no danger. Q. Where did you follow your conductor? Q. How did the Junior Warden dispose of you? A. He bid me be conducted to the Senior Warden in the west, and he to the Worshipful Master in the east, where the same questions were asked and like answers returned as before. Q. How did the Worshipful Master dispose of you? Q. What did the Worshipful Master then do with you? A. He made me a Mason in due form. A. Kneeling on my naked left knee, my right forming a square, my left hand supporting the Holy Bible, square, and compasses, my right resting thereon, in which due form I took the solemn oath of an Entered Apprentice, which is as follows, viz. ; (some Lodges require the obligation repeated, but not as a general thing). Q. After the obligation, what were you then asked? A. What I most desired. Q. Did you receive light? A. I did, by the order of the Worshipful Master and the assistance of the brethren. Q. On being brought to light, what did you first discover? A. The three great lights in Masonry, by the help of the three lesser. Q. What are the three great lights in Masonry? A. The Holy Bible, square, and compasses. Q. What are their Masonic use? A. The Holy Bible is the rule and guide to our faith and practice; the square, to square our actions; and the compasses, to circumscribe and keep us within bounds with all mankind, but more especially with a brother Mason. Q. What are the three lesser lights? A. Three burning tapers, in a triangular position. Q. What do they represent? A. The sun, moon, and Master of the Lodge. A. Because, as the sun rules the day, and the moon governs the night, so ought the Worshipful Master to endeavor to rule and govern his Lodge, with equal regularity. Q. What did you then discover? A. The Worshipful Master approaching me from the east, under the duegard and sign of an Entered Apprentice; who, in token of his brotherly love and favor, presented me with his right hand, and with it the grip and word of an Entered Apprentice and ordered me to arise and salute the Junior and Senior Wardens as an Entered Apprentice. Q. After saluting the Wardens, what did you then discover? A. The Worshipful Master approaching me from the east a second time, who presented me with a lambskin or white linen apron which he informed me was an emblem of innocence and the badge of a Mason; that it had been worn by kings, princes, and potentates of the earth; that it was more ancient than the Golden Fleece or Roman Eagle; more honorable than the Star or Garter, or any other order that could be conferred on me at that or any time thereafter by king, prince, potentate, or any other person, except he be a Mason; and hoped that I would wear it with equal Praise to myself and honor to the fraternity; and ordered me to carry it to the Senior Warden in the west, who taught me how to wear it as an Entered Apprentice. Q. How should an Entered Apprentice wear his apron? A. With the flap turned up. Q. After being taught to wear your apron as an Entered Apprentice, what were you then informed? A. That, agreeably to an ancient custom, adopted in every regulated and well-governed Lodge it was necessary that I should be requested to deposit something of a metallic kind, not from its intrinsic valuation, but that it might be laid up, among the relics in the archives of the Lodge, as a memorial that I was therein made a Mason; but, on strict examination, I found myself entirely destitute. A. I was ordered to be returned to the place from whence I came, and reinvested of what I had been divested of, and returned to the Lodge for further instructions. Q. On your return to the Lodge, where were you placed, as the youngest Entered Apprentice? A. In the northeast corner, my feet forming a right angle, my body erect, at the right hand of the Worshipful Master in the east, an upright man and Mason, and it was given me strictly in charge ever to walk and act as such. Q. What did the Worshipful Master then present you with? A. The working-tools of an Entered Apprentice Mason, which are the twenty-four-inch gauge and common gavel. A. The twenty-four-inch gauge is an instrument made use of by operative masons, to measure and lay out their work; but we, as Free and Accepted Masons, are taught to make use of it for the more noble and glorious purpose of dividing our time. It being divided into twenty-four equal parts is emblematical of the twenty-four hours of the day, which we are taught to divide into three parts, whereby we find a portion for the service of God and the relief of a distressed worthy brother, a portion for our usual avocations, and a portion for refreshment and sleep. The common gavel is an instrument made use of by operative masons, to break off the superfluous corners of rough stones, the better to fit them for the builder's use; but we, as Free and Accepted Masons, are taught to make use of it for the more noble and glorious purpose of divesting our minds and consciences of all the vices and superfluities of life, thereby fitting us, as living stones of that spiritual building, that house not made with hands, eternal in the heavens. [paragraph continues] 1826, and by Bernard, Allyn, Richardson, and others, the author will give it, that it may go to the world a complete Masonic lecture. Q. What were you next presented with? Q. What does it teach? A. It teaches me, as I was barely instructed in the rudiments of Masonry, that I should be cautious over all my words and actions, especially when before its enemies. A. A listening ear, a silent tongue, and a faithful heart. Q. What do they teach? A. A listening ear teaches me to listen to the instructions of the Worshipful Master, but more especially to the cries of a worthy distressed brother. A silent tongue teaches me to be silent in the Lodge, that the peace and harmony thereof may not be disturbed, but more especially before the enemies of Masonry. A faithful heart, that I should be faithful and keep and conceal the secrets of Masonry and those of a brother when delivered to me in charge as such, that they may remain as secure and inviolable in my breast as in his own, before being communicated to me. A. The Grand Master's check-word. A. Truth is a divine attribute, and the foundation of every virtue. To be good and true are the first lessons we are taught in Masonry. On this theme we contemplate, and by its dictates endeavor to regulate our conduct; hence while influenced by this principle, hypocrisy and deceit are unknown among us, sincerity and plain-dealing distinguish us, and the heart and tongue join in promoting each other's welfare, and rejoicing in each other's prosperity. With a few other interrogations and answers the old lecture ends. These interrogations and answers are embodied in the new-fangled lecture as already given; they relate only to the demand for something of a metallic kind, reinvestment of candidate's clothing, northeast corner of the Lodge, &c., &c.
Q. Why were you divested of all metals when made a Mason? A. For the reason, first, that I should carry nothing offensive or defensive into the Lodge; second, at the building of King Solomon's Temple, there was not heard the sound of an axe, hammer, or any tool of iron. Q. How could a building of that stupendous magnitude be erected without the aid of some iron tool? A. Because the stones were hewed, squared, and numbered at the quarries where they were raised; the trees felled and prepared in the forests of Lebanon, carried by sea in floats to Joppa, and from thence by land to Jerusalem, where they were set up with wooden mauls, prepared for that purpose; and, when the building was completed, its several parts fitted with such exact nicety, that it had more the resemblance of the handy workmanship of the Supreme Architect of the universe than of that of human hands. Q. Why were you neither naked nor clothed? A. Because Masonry regards no one for his worldly wealth or honors; it is the internal, and not the external qualifications of a man that should recommend him to be made a Mason. Q. Why were you neither barefoot nor shod? Q. Why were you hoodwinked, and a cable-tow put about your neck? to the manner and mode of my initiation, that I might have been led out of the Lodge, without seeing the form and beauty thereof. Q. Why were you caused to give three distinct knocks? A. To alarm the Lodge, and inform the Worshipful Master that I was prepared for Masonry, and, in accordance to our ancient custom, that I should ask. "Ask, and ye shall receive; seek, and ye shall find; knock, and it shall be opened unto you." Q. How did you apply this to your then situation in Masonry? A. I asked the recommendation of a friend to become a Mason; through his recommendation I sought admission; I knocked at the door of the Lodge and it was opened unto me. Q. Why were you received on the point of a sharp instrument pressing your naked left breast? A. As that was an instrument of torture to my flesh, so might the recollection of it be to my conscience, should I ever presume to reveal the secrets of Free-Masonry. Q. Why were you caused to kneel and attend at prayer? A. Because no man should ever enter upon a great and important undertaking without first imploring the blessings of Deity. Q. Why were you asked in whom you put your trust? A. Because, agreeably to our most ancient institution, no Atheist could be made a Mason; it was therefore necessary that I should put my trust in Deity, or no oath would have been considered binding among Masons. Q. Why were you taken by the right hand, ordered to arise, follow your conductor, and fear no danger? A. It was to assure me, as I could not foresee nor avoid danger, that I was in the hands of a true and trusty friend, in whose fidelity I might with safety confide. Q. Why were you conducted once around the Lodge? A. That the brethren might see that I was duly and truly prepared. Q. Why were you caused to meet with the several obstructions on your passage? A. 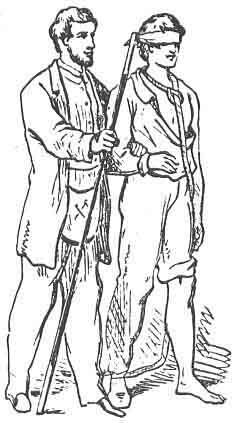 Because there were guards placed at the south, west, and east gates of the courts of King Solomon's Temple, to see that none passed or repassed but such as were duly and truly prepared and had permission; it was therefore necessary that I should meet with these several obstructions, that I might be duly examined before I could be made a Mason. Q. Why were you caused to kneel on your naked left knee? of man; it was therefore to show that it was the weaker part of Masonry I was then entering upon, being that of an Entered Apprentice. Q. Why were you caused to rest your right hand on the Holy Bible, square, and compasses? A. Because the right hand was supposed by our ancient brethren to be the seat of fidelity, and so they worshipped Deity under the name of Fides, which was supposed to be represented by the right hands joined, and by two human figures holding each other by the right hand; the right hand, therefore, we masonically use to signify in the strongest manner possible the sincerity of our intentions in the business in which we are engaged. Q. Why were you presented with a lambskin or white linen apron, which is the badge of a Mason? A. Because the lamb, in all ages, has been deemed an emblem of innocence; he, therefore, who wears the lambskin as a badge of a Mason is thereby continually reminded of that purity of life and conduct which is essentially necessary to his gaining admission into that celestial Lodge above, where the Supreme Architect of the universe presides. Q. Why were you requested to deposit something of a metallic kind? A. To remind me of my extremely poor and penniless state, and that, should I ever meet with a friend, more especially with a brother, in like destitute circumstances, I should contribute as liberally to his relief as his circumstances demanded, without any material injury to myself. A. Because the first stone of a building is usually laid in the northeast corner. I was therefore placed there to receive my first instructions where to build my future Masonic and moral edifice. Q. What is a Lodge? [paragraph continues] Holy Bible, square, and compasses, and charter, or warrant empowering them to work. Q. Where did our ancient brethren usually meet? A. The better to observe the approach of cowans, or eaves-droppers, ascending or descending. Q. What is the form and covering of a Lodge? A. An oblong square, extending from east to west, between the north and south, from the earth to the heavens, and from the surface to the centre. Q. Why of such vast dimension? A. To signify the universality of Masonry, and that a Mason's charity should be equally extensive. Q. What supports this vast fabric? A. Three great pillars, constituting Wisdom, Strength, and Beauty. Q. Why are they so called? A. Because it is necessary there should be wisdom to contrive, strength to support, and beauty to adorn all great and important undertakings. Q. By whom are they represented? A. By the Worshipful Master, and the Senior and Junior Wardens. Q. Why are they said to represent them? A. The Worshipful Master represents the pillar of Wisdom, because he should have wisdom to open his Lodge, set the craft at work, and give them proper instructions. The Senior Warden represents the pillar of Strength, it being his duty to assist the Worshipful Master in opening and closing his Lodge, to pay the craft their wages, if any be due, and see that none go away dissatisfied, harmony being the strength of all institutions, more especially of ours. The Junior Warden represents the pillar of Beauty, it being his duty at all times to observe the sun at high meridian, which is the glory and beauty of the day. Q. What covering has a Lodge? Q. What furniture has a Lodge? Q. To whom are they dedicated? A. The Bible is dedicated to God, the square to the Master, and the compasses to the craft. Q. Why are they thus dedicated? Q. What are the ornaments of a Lodge? A. The mosaic pavement, the indented tessel, and the blazing star. A. The mosaic pavement is a representation of the Ground Floor of King Solomon's Temple, with a blazing star in the centre; the indented tessel, that beautiful tessellated border which surrounds it. Q. Of what are they emblematical? Q. How many lights has a Lodge? Q. How are they situated? A. East, west, and south. Q. None in the north? Q. Why none in the north? A. Because this and every other Lodge is, or ought to be, a true representation of King Solomon's Temple, which was situated north of the ecliptic; the sun and moon, therefore, darting their rays from the south, no light was to be expected from the north. We therefore, masonically, term the north a place of darkness. Q. How many jewels has a Lodge? Q. What are the movable jewels? A. The rough ashler, the perfect ashler, and the trestle-board. A. Rough ashler is a stone in its rough and natural state; the perfect ashler is also a stone, made ready by the working-tools of the fellow craft, to be adjusted in the building; and the trestle-board is for the master workman to draw his plans and designs upon. Q. Of what do they remind us? A. By the rough ashler we are reminded of our rude and imperfect state by nature; by the perfect ashler of that state of perfection at which we hope to arrive by a virtuous education, our own endeavors, and the blessing of God; and by the trestle-board we are also reminded that, as the operative workman erects his temporal building agreeably to the rules and designs laid down by the Master on his trestle-board, so should we, both operative and speculative, endeavor to erect our spiritual building agreeably to the rules and designs laid down by the Supreme Architect of the universe, in the great book of Revelation, which is our spiritual, moral, and Masonic trestle-board. Q. What are the three immovable jewels? A. The square, level, and plumb. Q. What do they masonically teach us? A. The square teaches morality; the level, equality: and the plumb teaches rectitude of life. Q. How should a Lodge be situated? A. Due east and west. A. Because, after Moses had safely conducted the children of Israel through the Red Sea, by Divine command he erected a tabernacle to God, and placed it due east and west, which was to commemorate to the latest posterity that miraculous east wind that wrought their mighty deliverance--this was an exact model of Solomon's Temple; since which time every well regulated and governed Lodge is, or ought to be, so situated. Q. To whom were Lodges dedicated in ancient times? A. Because it was said he was our most ancient Grand Master, or the founder of our present system. Q. To whom in modern times? a Mason keeps himself circumscribed within their precepts it is impossible that he should materially err. Q. What are the points of your profession? A. Brotherly love, relief, and truth. Q. Brother. you informed me that I should know you by certain signs, and tokens, and words, and the points of your en-trance. You have already satisfied me as to the signs and words. I now require you to explain to me the points of your entrance: how many, and what are they? A. They are four: the Guttural, the Pectoral, the Manual, and the Pedestal, which allude to the four cardinal virtues, viz. ; Temperance, Fortitude, Prudence, and Justice. This virtue alludes to the Mason's obligation, which is the Guttural. Prudence teaches us to regulate our lives and actions agreeably to the dictates of our reason, and is that habit by which we wisely judge, and prudentially determine, on all things relative to our present, as well as to our future happiness. This virtue should it be the invariable practice of every Mason never to for the government of his conduct while in the Lodge, but also when abroad in the world. It should be particularly attended to in all strange and mixed companies, never to let fall the least sign, token, or word, whereby the secrets of Masonry might be unlawfully obtained. Especially, brother in Masonry, you should always remember your oath as an Entered Apprentice, while kneeling at the altar, on your naked left knee, your left hand supporting the Holy Bible, square, and compasses, your right resting thereon, which alludes to the Manual. Justice is that standard or boundary of right which enables us to render to every man without distinction his just due. This virtue is not only consistent with Divine and human laws, but is the very cement and support of civil society; and as Justice in. a great measure constitutes the real good man, so should it be the invariable practice of every Mason never to deviate from the minutest principles thereof. 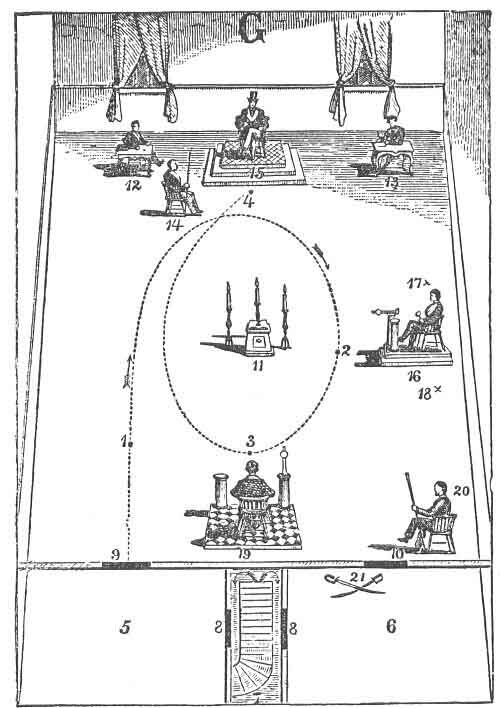 The charge you received while standing in the northeast corner of the Lodge, your feet forming a right angle, was an allusion to the Pedestal. Q. How did Entered Apprentices serve their Master in ancient times, and how should they in modern? A. With freedom, fervency, and zeal. Q How were they represented? Q. Why were they said to represent them? A. Because it was said there was nothing more free than chalk, which, under the slightest touch, leaves a trace behind; nothing more fervent than charcoal to melt--when well lit, the most obdurate metals will yield; nothing more zealous than clay, or our mother earth, to bring forth. BROTHER: As you are now introduced into the first principles of Masonry, I congratulate you on being accepted into this ancient and honorable order; ancient, as having existed from time immemorial; and honorable, as tending in every particular so to render all men who will conform to its precepts. No human institution was ever raised on a better principle, or more solid foundation; nor were ever more excellent rules and useful maxims laid down than are inculcated in the several Masonic lectures The greatest and best of men in all ages have been encouragers and promoters of the art, and have never deemed it derogatory to their dignity to level themselves with the fraternity, extend their privileges, and patronize their assemblies. There are three great duties, which, as a Mason, you are strictly to observe and inculcate--to God, your neighbor, and yourself. To God, in never mentioning His name but with that reverential awe which is due from a creature to his Creator; to implore His aid in all your laudable undertakings, and to esteem Him as your chief good. To your neighbor, in acting upon the square, and doing unto him as you would he should do unto you: and to yourself, in avoiding all irregularity and intemperance, which may impair your facilities or debase the dignity of your profession. A zealous attachment to these duties will insure public and private esteem. In the State you are to be a quiet and peaceable citizen, true to your government, and just to your country; you are not to countenance disloyalty or rebellion, but patiently submit to legal authority, and conform with cheerfulness to the government of the country in which you live. for the institution to lead you into arguments with those who, through ignorance, may ridicule it. But, at your leisure hours, that you may improve in Masonic knowledge, you are to converse with well-informed brethren, who will be always as ready to give as you will be ready to receive instruction. Finally, keep sacred and inviolable the mysteries of the Order, as these are to distinguish you from the rest of the community, and mark your consequence among Masons. 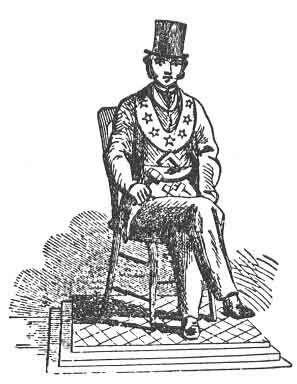 If, in the circle of your acquaintance, you find a person desirous of being initiated into Masonry, be particularly careful not to recommend him, unless you are convinced he will conform to our rules; that the honor, glory, and reputation of the institution may be firmly established, and the world at large convinced of its good effects. You, brother, are a preacher of that religion, of which the distinguishing characteristics are universal benevolence and unbounded charity. You cannot, therefore, but be fond of the Order, and zealous for the interests of Freemasonry, which, in the strongest manner, inculcates the same charity and benevolence, and which, like that religion, encourages every moral and social virtue; which introduces peace and good-will among man. kind, and is the centre of union to those who otherwise might have remained at a perpetual distance. So that whoever is warmed with the spirit of Christianity, must esteem, must love Freemasonry. Such is the nature of our institution, that, in all our Lodges, union is cemented by sincere attachment, hypocrisy and deceit are unknown, and pleasure is reciprocally communicated by the cheerful observance of every obliging office. Virtue, the grand object in view, luminous as the meridian sun, shines refulgent on the mind, enlivens the heart, and converts cool approbation into warm sympathy and cordial affection. Though every man, who carefully listens to the dictates of reason, may arrive at a clear persuasion of the beauty and necessity of virtue, both public and private. yet it is a full recommendation of a society to have these pursuits continually in view, as the sole objects of their association; and these are the laudable bonds which unite us in one indissoluble fraternity. For the ceremony of closing a Lodge, see the end of the Third, or Master Masons' Degree, page 142. 12:1 In most foreign Lodges the Master wears his hat, while the rest of the brethren remain uncovered. This practice was followed by MacKenzie Beverly Esq., when he held the office of D. P. G. M. for the East Riding of York.--Historical Landmarks, vol. i. p. 138. 13:1 From the affair of Jephthah, an Ephraimite was termed a cowan. In Egypt, cohen was the title of a priest or prince, and a term of honor. Bryant, speaking of the harpies, says, they were priests of the sun; and, as cohen was the name of a dog as well as a priest, they are termed by Apollonius "the dogs of Jove." Now, St. John cautions the Christian brethren, that "without are dogs" (κυνες), cowans or listeners (Rev. xxii. 15), and St. Paul exhorts the Christians to "beware of dogs, because they are evil workers" (Phil. W. 2). Now, κυων, a dog, or evil worker, is the masonic cowan.--Historical Landmarks, vol. i. p. 349. 15:1 The ceremony of OPENING THE LODGE is solemn and impressive. Every brother is reminded of his duties and obligations. The necessary precautions are employed to avoid the intrusion of the profane, and every member, being compelled to assume a share of the necessary forms, is thus admonished that Masonry is a whole of which each Mason forms a part.--Lexicon. The first business which occupies the brethren at their stated meetings is what is technically called opening the Lodge. It is a solemn and imposing rite, and strongly files the attention of every serious Mason. Every officer is made acquainted with his duty, and seriously impressed with the importance attached to his situation.--Theo. Phil., p. 272-3. 18:1 When a Mason enters a Lodge after it is opened and at work, he proceeds to the centre of the Lodge, at the altar, and, facing the Worshipful Master in the east, gives the duegard and sign of the degree in which the Lodge is working. The duegard is never omitted when the Master is addressed. 28:1 Every initiated person, whether prince, peer, or peasant, is bound, al least once during his Masonic career, to pass through this emblematical p. 29 feature of his profession, as an unmistakable pledge of fidelity. He may not like it. He may object to it. He may think it degrading. But he has no option. He cannot avoid it. If he seriously intends to be a Mason, he must endure it with patience, as an indispensable condition of his tenure. And accordingly no instance is on record where the privilege of initiation has been abandoned from a rejection of this preliminary ceremony. Nor has any one, when the rite has been completed, ever found reason to question its propriety. Such a proceeding is, indeed, utterly improbable, for it bears such a beautiful analogy to the customs of all primitive nations, that its origin may be reasonably ascribed to some unfathomable antiquity, which might probably extend--although we have no evidence of the fact--to a period before the universal deluge. "The reverence indicated by putting off the covering of the feet," says Dr. Kitts, "is still prevalent in the East. The Orientals throw off their slippers on all those occasions when we should take off our hats. They never uncover their heads, any more than we do our feet. It would everywhere, whether among Christians, Moslems, or pagans, be considered in the highest degree irreverent for a person to enter a church, a temple, or a mosque, with his feet covered." In like manner our Mosaic pavement is accounted pure and immaculate; and therefore no pollution can be tolerated on that sacred floor." --The Freemason's Treasury, p. 177. 30:1 This is the first admission of a candidate before initiation. He avows airs belief and trust in God: and it is on that avowal alone that his admission among us is based. If he refused to acknowledge the being of a God would he at once rejected; but on the receipt of a solemn declaration that he puts his trust in God, the chief officer of the Lodge expresses his satisfaction, and tells him that where the name of God is invoked no danger can possibly ensue.--Historical Landmarks, vol. i. p. 45. 31:1 NOTE.--If more than one candidate is being initiated at once, they p. 32 are required to take hold of each other's arms. Five are about as many as can be initiated at once; the same number "passed" to Second Degree; but only one at a time can be raised to the Master's Degree. Small Lodges cannot manage but one at a time conveniently. 34:1 Neither Adam, nor Nimrod, nor Moses, nor Joshua, nor David, not Solomon, nor Hiram, nor St. John the Evangelist, nor St. John the Baptist belonged to the Masonic Order. It is unwise to assert more than we can prove, and to argue against probability. There is no record, sacred or profane, to induce us to believe that these holy and distinguished men were Freemasons, and our traditions do not go back to their days.--Dr Dalcho, G. M. of South Carolina. Historical Landmarks, vol. i, p. 59. (1) When addressed as an inquiry to a visiting brother, it has the same import as that in which it is used, under like circumstances, by mariners. Thus, "Whence do you hail?" that is, "of what Lodge are you a member?" Used in this sense, it comes from the Saxon term of salutation "Hael," and should be spelled "hail." (2.) Its second use is confined to what Masons understand by the "tye," and in this sense signifies to conceal, being derived from the Saxon word "helan," to hide.--Lexicon. 35:1 In some Lodges, at the words "throat cut across," one of the members, or the conductor, draws his hand across candidate's throat: sometimes they draw the sword. 35:2 A terrible instance of the consequences which attended a violation of this principle has been handed down to us in the story of Hipparchus, a Pythagorean, who, having out of spleen and resentment violated and broke through the several engagements of the society, was held in the utmost detestation, expelled from the school as a most infamous and abandoned Person; and, as he was esteemed dead to the principles of virtue and Philosophy, they had a tomb erected for him, according to their custom, as though he had been naturally dead. The shame and disgrace that justly attended so great a breach of truth and fidelity, drove the unhappy wretch to such despair that he proved his own executioner; and so abhorred was even his memory, that he was denied the rites and ceremonies of burial used to the dead in those times; instead of which, his body was suffered to lie upon the sands of the seashore in the Isle of Samos, to be devoured by rapacious animals.--Theo. Phil., vol. I. pp. 246-7. 35:3 Light is the first demand of a candidate at his initiation; and the material light is succeeded by an intellectual illumination.--Historical Landmarks, vol. i. p. 135. 38:1 The palate and throat being the chief seat of irregular appetites, we are instructed by the first sign to avoid temptation by a proper restraint on our passions; that we may be temperate in all our indulgences, and never exceed the boundary-line of decency and decorum, under the penalty of disobedience, or the violation of those engagements which, as Masons, we have voluntarily assumed.--Theo. Phil., p. 289. 40:1 The Master, assisted by the Senior Warden, lays the chief corner-stone of a beautiful fabric.--Theo. Phil., p. 274. 41:1 The labors are conducted on a plan which is intended to produce an exciting spirit of emulation. Every individual is personally and in turn requested by the Worshipful Master to give his opinion on some specific doctrine or ceremony propounded from the Chair. He may, or he may not, be willing or able to comply with the demand. If the former, he enlightens the members by his disquisition; and if he declines the task, a alight sign is a sufficient negative, and the query is transferred to the next in succession, whose absolute freedom of will is acknowledged by leaving him at full liberty to act as he may feel disposed.--The Freemason's Treasury, p. 149. 43:1 The Tracing Board combines all the Landmarks of the Degree, and Includes the essence of its lectures and illustrations. It opens with mortality in its feeblest state; poor and penniless, and blind and naked; and conducts the pious inquirer to a glorious immortality.--Historical Landmarks, vol. i. p. 134. 44:1 The candidate is obligated in the east and invested in the west; advances from west to east by right lines and angles, to typify the necessity of an upright life and well-squared actions; and he is subsequently placed in the northeast to receive instruction, as a corner-stone, from which a superstructure is expected to rise, perfect in its parts and honorable to the builder.--The Freemason's Treasury, p. 24. 48:1 Among the ancient Israelites, the SHOE was made use of in several significant ways. To put off the shoes imported reverence, and was done in the presence of God, or on entering the dwelling of a superior. To unloose one's shoe, and give it to another, was the way of confirming a contract.--Lexicon. 48:2 DARKNESS among Freemasons is emblematical of ignorance; for as our science has technically been called "LUX," or light, the absence of light must be the absence of knowledge. Hence the rule, that the eye should not see until the heart has conceived the true nature of those beauties which constitute the mysteries of our Order. Freemasonry has restored Darkness to its proper place, as a state of preparation.--Lexicon. 50:1 It was asserted by Aristotle, that "he who bears the shocks of fortune valiantly and demeans himself uprightly, is truly good, and of a SQUARE POSTURE, without reproof." --Historical Landmarks, vol. i. p. 189. 52:1 Every Lodge is furnished with six JEWELS, three of which are movable and three immovable. The movable jewels, so called because they are not confined to any particular part of the Lodge. are the rough ashler, the perfect ashler, and the trestleboard. The immovable jewels are the square, the level, and the plumb. They are termed immovable, because they are appropriated to particular parts of the Lodge, where alone they should be found, namely, the square in the east, the level to the west, and the plumb to the south--Lexicon. 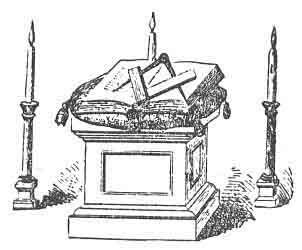 54:1 Each Degree of Masonry contains a course of instruction, in which the ceremonies. traditions, and moral instruction appertaining to the Degree are set forth. This arrangement is called a LECTURE. In the Entered Apprentices' Degree, the first section describes the proper mode of initiation, and supplies the means of qualifying us for our privileges. and of testing the claims of others The second section rationally accounts for all the ceremonies peculiar to this Decree. The third section explains the nature and principles of our institution, and instructs us in the form and construction of the Lodge, furnishing, in conclusion, some important lessons on the various virtues which should distinguish a Freemason.--Lexicon. 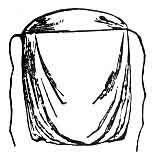 55:1 Pectoral, a breastplate; especially, a sacerdotal habit or vestment worn by the Jewish High-Priest.--Webster.